Registering or renewing license plates in South Carolina is done through the Department of Motor Vehicles. Vehicle owners can apply for standard plates, specialty plates, or disability plates. Most plates have the option to be personalized for an additional fee. For available plate numbers, it is possible to look them up online before applying. 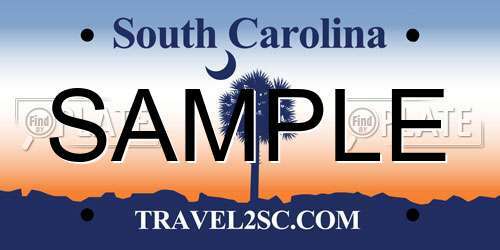 All vehicles owned by South Carolina residents are required to have license plates on their vehicles. Standard License Plates - White and blue background plate with dark blue lettering (available to all who register their vehicle). Specialty License Plates - varies by type and have a unique design based on the organization, occupation, or caused associated to it. Disability License Plates - issued only for those with a disability and requires eligibility criteria. Temporary License Plates - for those who purchase a new vehicle to drive legally through the registration process. Prices vary by plate type and may include additional requirements to register. Specialty license plates may require additional documentation for proof of enrollment or association. For example, military license plates require proof of being enlisted or valid discharge papers. Additionally, those registering must have valid certification of any military awards to obtain specific honorary plates. The fees required for specialty plates vary by type. Some charitable and organizational fees receive a portion of the plate fee to support their causes or initiatives. Applications with be reviewed by the staff at the DMV to ensure they follow the above guidelines. To look up available license plates in North Carolina, use the search bar above. People with disabilities may be qualified to obtain disability license plates for the DMV. Disability plates and placards permit people with disabilities to park in designated parking spaces throughout the state. All vehicles owned by North Carolina residents must be registered to drive legally throughout the state. For any new residents, it is required to register their out-of-state vehicle(s) within 45 days. For residents who are purchasing a new or used vehicle, it is required to register it within 45 days. It it possible to register vehicles either by mail or in person. New registration stickers will be issued which must be placed over the old ones. When a new vehicle is purchased, owners can transfer their old license plates for a nominal fee. It is typically not possible to transfer license plates to the person purchasing a used vehicle. Plates can be surrendered by mailing or dropping off plates at a local DMV office. Please contact a local DMV office for more information about fees and taxes for specific car types. Use the search bar above to begin looking up license plates in North Carolina or any state across the U.S.